We’d love your help. 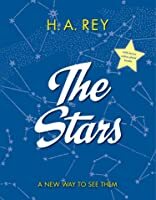 Let us know what’s wrong with this preview of The Stars by H.A. Rey. To ask other readers questions about The Stars, please sign up. H.A. Rey, author of the Curious George books, studied philosophy and natural sciences after World War I. He transformed his enjoyment of star gazing into this user-friendly guide for star recognition and the finding of constellations. If you know the stars you are not easily lost. They tell you the time and direction on land, on sea, and in the air, and this can be valuable on many occasions. The Stars is d Click here to watch a video review of this book on my channel, From Beginning to Bookend. The Stars is divided into two segments. The first half of the book is dedicated to introducing stargazing in the most comprehensive means possible for beginners. Ordinarily, constellations are presented as either allegorical images or confusing geometric shapes. Not so in The Stars. [This book] shows the constellations in a new, graphic way, as shapes which suggest what the names imply: it shows the group of stars known as the Great Bear, in the shape of a bear; the Whale in the shape of a whale; the Eagle as an eagle, and so on. These shapes are easier to remember, and once you remember them you can retrace them in the sky. Forty star charts are provided that depict where and when to search for individual constellations. Though the book is designed mainly for users in northern latitudes (from 30 to 50 degrees), star charts for all other latitudes and their constellations are included. The second half of the book is more scientifically advanced and introduces complex theories and terms. Altitude, the rotation of the earth on its axis, latitude and longitude, solar and sidereal days, black holes, solar eclipses, and much more are explored in great detail. Stars are enchanting specks of glistening light in the night sky, but Rey succeeds in making them sound even more enticing and ignites a desire to grab a sweater and peer up at the sky on the next clear night. And should you venture into outer space, anywhere in the solar system, where no earthly landscape exists, the constellations would be your only guidepost, and familiar ones, too. A helpful index and glossary are included at the back of the book and, as an added bonus, the book jacket unfolds into a 22 X 26" poster that's a chart of the night sky with all of the constellations drawn on it. Yeah: it's good. And really easy to understand, and fun, too. This book contains the most lucid explanation of the sidereal day I have ever read. If you are looking for a book that explains the big bang theory and modern astronomical theories, this is not your book. If you are want to look up at the sky and recognize stars like old friends, then this is your book. Along the way, you will learn enough about the relative motions of the earth, sun, planets and stars to understand why different parts of the sky are visible at different times of the year, and f This book contains the most lucid explanation of the sidereal day I have ever read. If you are looking for a book that explains the big bang theory and modern astronomical theories, this is not your book. If you are want to look up at the sky and recognize stars like old friends, then this is your book. This book is awesome. I think the constellation Orion (along with down comforters, cardinals, and the sauna) is one of the things that makes life in winter not just bearable but lovely. I have lived in Bloomington for ten years, but I still get lost sometimes. Once when I was biking drunk to my new house, I navigated by the stars and made it home just fine. I often try to read books outside of my own particular area of experience. This is one such book, and now I think I'm stuck with a new hobby. This book was a fun introduction to stargazing. The basics of finding the constellations along with all the terminology that goes with it are introduced in a lively and understandable way. More so than any other book I've read before that talked about stars and planets, H.A. Rey (of Curious George fame) brings an excitement and love to the subject that are infectious. The book includes an introduction to all the constellations that can be seen from the northern hemisphere and gives helpful tips on how to find them. (Sorry friends below the equator, you might not find this book as interesting; although he touches on the southern stars and includes star charts for those living in the southern hemisphere, the focus of the book is in the north.) The book includes star charts for all times of the year, with a few thrown in for those below the equator and those in the far north (say Alaska). The last section of the book explains the science behind astronomy, and I found it absolutely fascinating. Rey explains the difference between solar days and sidereal days, the ecliptic and the zodiac, equinoxes, solstices, eclipses and many more topics of interest. Along with the basic tips for finding constellations, you may also find such fun tidbits as how to tell time by looking at the stars. "If we started out with the discussion of the elliptic, or why the sidereal day is about four minutes shorter than the solar day, your reaction might be: Do I have to go through this?" This is a quote I took from the book Stars: A New Way to See them. The author H.A.Rey continues to go on and say, "the whys come later..." I believe this is a quote represents the idea behind this book. It is for people who are just interested in knowing about stargazing, and the technical stuff is just optional. I "If we started out with the discussion of the elliptic, or why the sidereal day is about four minutes shorter than the solar day, your reaction might be: Do I have to go through this?" This is a quote I took from the book Stars: A New Way to See them. The author H.A.Rey continues to go on and say, "the whys come later..." I believe this is a quote represents the idea behind this book. It is for people who are just interested in knowing about stargazing, and the technical stuff is just optional. I really enjoyed reading this informational book. There are many aspects of the format and style that I especially liked. The author used simple means of communication to cover a bizarre and complex topic, and also had a mildy humorous tone to keep it interesting. There were many star-charts included for practical purposes along with in depth description of each constellation and of course all of the whys? and hows? at the end. This book was pretty interesting at first. Then it was kind of confusing. 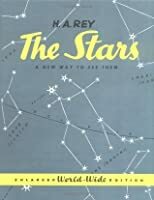 Excellent astronomy book for those who casually want to learn their way around the sky. Lovely illustrations, more sensical constellation drawings, and succinct explanations of the basics of how stars, planets, and the like work. Wish I would have had this when I took my astronomy class, as it would have been a much better explainer for some of the topics that the textbook insisted on making incredibly complicated. Such a perfect book for someone just getting into stargazing. Fantastic illustrations and simple explanations of very complex astronomical and scientific concepts. Updating that I'm "finished" with this book isn't exactly true – although I've now read the book from cover to cover, there's still a lot for me to learn about the constellations, and I've only memorized a glimpse of what I've read. However, when I study constellations again, I'll surely pick up "The Stars: A New Way to See Them" again. "The Stars" by H.A. Rey is a great book for studying the constellations and learning the basics of astronomy. It first shows some of the easier formations of the Updating that I'm "finished" with this book isn't exactly true – although I've now read the book from cover to cover, there's still a lot for me to learn about the constellations, and I've only memorized a glimpse of what I've read. However, when I study constellations again, I'll surely pick up "The Stars: A New Way to See Them" again. "The Stars" by H.A. Rey is a great book for studying the constellations and learning the basics of astronomy. It first shows some of the easier formations of the sky, then builds up the big picture a few constellations at a time. Rey also offers intriguing facts about both the science and the mythology of the stars. This book is fantastic. It is well-written and well-illustrated (no surprise there). I highly recommend as an introduction for someone new to stargazing but even a stargazing veteran like myself will find it enjoyable and enlightening. I need to buy a copy. This book is now 65 years old (and has been updated). The information is still fun if one wants to watch the stars. Easy to read, with charts to use while gazing up at night, and time tables that will help find the constellations of the season. Rey has redrawn the graphics so the constellations connect the stars in a pattern that looks more like what it represents. Same stars, different imaginary lines. There are over 30 pages of descriptive constellation charts which describe how to find them, where and when to look, a bit of the story and tips on remembering what’s around them. There are 12 different Calendar charts which give you the sky view with just the stars and then with the constellations drawn in so you can look up exactly which chart to look at depending on when you are looking (to the hour) There’s a table for finding the planets (which move) accurate through 2026 (and an included web address accurate through 2100) This is a great resource for the lay stargazer. Well written without going into too much detail, the illustrations are humorous (there are occasional guide people) and make the text easy to understand. A wonderful resource - however, the cover art makes it look deceptively like an old book - don’t be fooled, it’s been updated, and besides, the stars don’t change. Review cross-posted to http://kissthebook.blogspot.com CHECK IT OUT! A classic for beginning astronomers, excellent for the whole family. This is a classic in introductory astronomy books! The bulk of the book very nicely introduces constellations, suggesting best times to see them. The last third of the book contains updated theory behind celestial mechanics for layman, and it is very well written as well. It is amazing how many details in the book there are. In the text there are easy analogies, some mnemonics, even a joke or two. Design of the tables, images and charts all use the same blue color for accentuation. Even the qualit This is a classic in introductory astronomy books! It is amazing how many details in the book there are. In the text there are easy analogies, some mnemonics, even a joke or two. Design of the tables, images and charts all use the same blue color for accentuation. Even the quality of the paper, the chosen font, and the binding... So many things are just superb. Excellent introduction to the stars! There is a whole series of plain star maps set alongside constellation maps that make it easy and pleasurable to study and identify the constellations. As Albert Einstein wrote to the author, "Many thanks for your lucid and stimulating book. I hope it will find the interest it deserves." Marvelous. Great household reference book for any age. Wonderfully clear writing. If you just want to find Orion, this will help. If you want a layman’s astronomy explanation of how these interplanetary rotations manifest themselves this will do it. Perfect reference book. The illustrations put this in another category altogether, by the same author who did Curious George. What a fantastic book for beginner star gazers. I was expecting a child oriented book but found a great resource for anyone interested in the night sky. 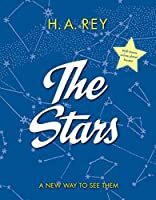 This book literally changes how you see constellations. Gemini, Leo etc. all pop out at you in a way that should have been self evident. Great for parents to teach kids about astronomy. The drawings of the constellations and the motion of the earth, moon, and stars are phenomenal. The prose is engaging and fascinating to adults and kids. This is a great book if you want to start stargazing or if you go on a regular basis. It has great star charts and excellent explanations of why the night sky looks the way it does. 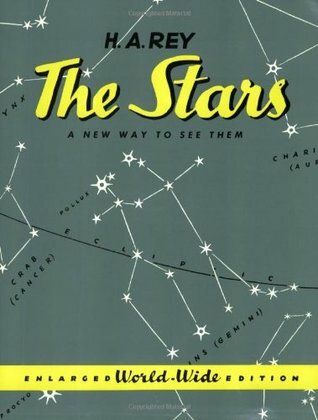 Who knew the guy who created Curious George also wrote an accessible, engaging guide to the stars and constellations? Everyone, buy and read this book! Rey H.A. 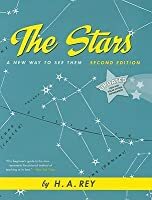 The Stars : A New Way to See Them NON-FICTION 160 pgs. Houghton Mifflin Harcourt, 2016. $9.99. Content: G.
Everything you want to know about the stars, told in a very down to earth way. It’s not super scientific, not full of theories or heavy explanations, just what you need to know to look into the heavens and really see the stars! Originally published in 1954, but updated a little for the 21st century audience. (There is an explanation of what happened to Pluto, the charts have been Rey H.A. The Stars : A New Way to See Them NON-FICTION 160 pgs. Houghton Mifflin Harcourt, 2016. $9.99. Content: G.
This is a great resource for the lay stargazer. Well written without going into too much detail, the illustrations are humorous (there are occasional guide people) and make the text easy to understand. A wonderful resource - however, the cover art makes it look deceptively like an old book - don’t be fooled, it’s been updated, and besides, the stars don’t change. See from all the reviews how universally good and welcome an impression this book makes on all who try out using it. Once you see it, no other star guide will do. So it's crazy that Rey's system has not universally caught on. That you can still go to a stargazing talk and find Capella counted as Auriga's foot, which makes no sensible pattern in the sky at all. Rey makes Capella Auriga's eye, and by its virtue of being sensible, Rey's Capella is fixed from an early age as how I will see Capella fo See from all the reviews how universally good and welcome an impression this book makes on all who try out using it. Once you see it, no other star guide will do. So it's crazy that Rey's system has not universally caught on. That you can still go to a stargazing talk and find Capella counted as Auriga's foot, which makes no sensible pattern in the sky at all. Rey makes Capella Auriga's eye, and by its virtue of being sensible, Rey's Capella is fixed from an early age as how I will see Capella for life. 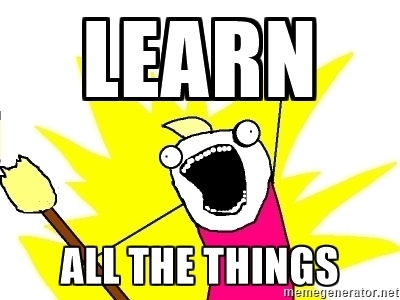 Recommends it for: People who like learning stuff. If you've ever gone camping and looked up at the stars and said 'What the heck am I looking at?" this book is for you. Originally written for children, The Stars: ANew Way to See Them, will teach you all of the constellations in a clear and simple manner. Mr. Rey, co-author of the curious george books, took it upon himself to redraw all of the constellations so they actually look like something recognisable. Most star charts are just a jumble of boxes and triangles with no recognizable shapes. Fo If you've ever gone camping and looked up at the stars and said 'What the heck am I looking at?" this book is for you. 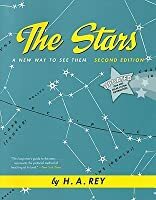 Originally written for children, The Stars: ANew Way to See Them, will teach you all of the constellations in a clear and simple manner. For instance on a regular star chart Tarus looks nothing like a bull but Mr. Rey's version, using the same stars, definitly looks like one.